Sinclair Theatre and Dance presents Moving Spirits, a dance event, for two performances only May 19-20 (both at 8 p.m.) in Blair Hall Theatre, building 2, downtown Dayton campus (Fourth St.) Directed by Rodney Veal and featuring choreography by Erin Long-Robbins, Denise Miller and Elisa Kappedal there will be 6 pieces performed by Sinclair students and the South Dayton Dance Studio. The beauty of dance begins within the soul and movement becomes an extension of the dancer's body, mind and spirit. 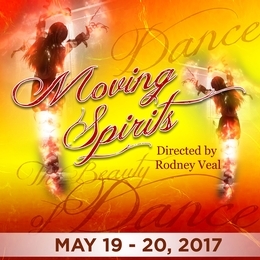 This is storytelling at its finest; incorporating various genres of dance as the catalysts to exploring that moving spirit. Chelsea Overman, Jacob Weybright, Sha-lemar Davis, Justin Lampkins, Thomas Puckett, Tristan Rivera, Elisa Fuentes, Hannah Anderson, Sydney Baker, Erin McGee, DeShawn Christian, Hannah Brooks, Jenna Bousquette, Quiterie Gianina Gabrielle, Shayla James-Birdsong, Jackie Bush, Alexa Fote, Kailey Hackathorne, Emma Meilinger, Catharine Thomas, Casey Graff, Maddy Hoy, Morgan Montour, Dara Schlesinger, Dana Sheldon, Avery James Wolf.